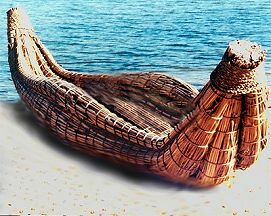 Here are descriptions and pictures of some of the Native American boat styles developed by different tribes over the years. 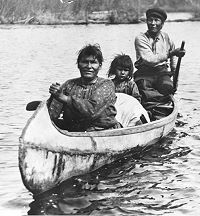 Canoes are the most common type of traditional native American boat, used throughout much of North America, Central America, the Caribbean, and many parts of South America. In fact, the word canoe comes from the Carib Indian word for a canoe, kenu. There are many different Native American canoe styles, and tribes could often easily recognize each other just by the profile of their canoes. 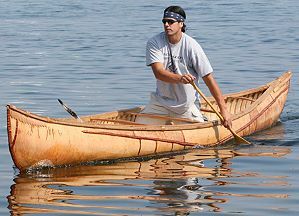 In general, native canoes fall into the following three major categories: dugout canoes, bark canoes, and plank canoes. Northwest Coast dugout canoes Dugout canoes have the simplest construction of the three, being made of hollowed-out wooden logs. 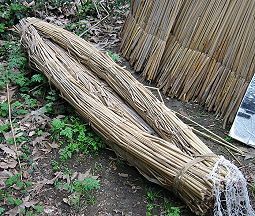 Some Indian dugout canoes were fairly rudimentary, particularly in South America, where logs were only minimally adapted from their original shape. 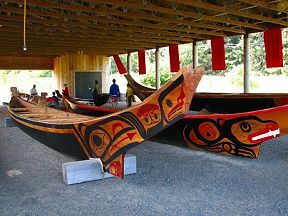 Other Native Americans, such as the Northwest Coast tribes, used sophisticated wood carving and bending techniques to make their dugout canoes swifter and more seaworthy. Penobscot birch bark canoe Bark canoes, used primarily in the Northeast Woodlands and Great Lakes areas, are a lightweight boat style consisting of birch-bark or elm-bark stretched over a wooden frame. Here is a page comparing different tribal styles of birchbark boats. 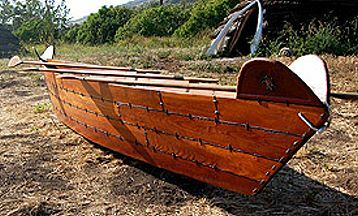 Chumash plank canoe Plank canoes are an uncommon style of American Indian canoes, used primarily on the West Coast, in which planks of cedar wood were seamed together instead of a single log being hollowed out. 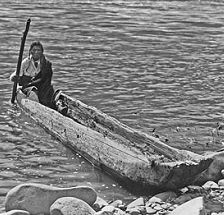 Except for this more complicated construction technique, the style of these boats was similar to dugouts made by neighboring tribes. Their round shape made bull boats much slower and harder to steer than canoes, but they were comparatively easy to build and could carry a lot of weight-- up to half a ton! A bullboat itself was so light that it could be carried on one person's back. They were usually made and paddled by women. 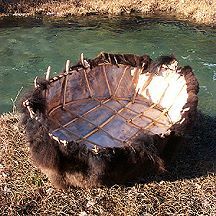 Groups of Native Americans on hunting trips or foraging expeditions would carry bullboats with them to ferry meat and firewood back home, or sometimes just to ford rivers more easily. 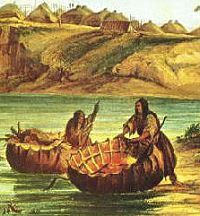 Rafts are the simplest form of American Indian boat. 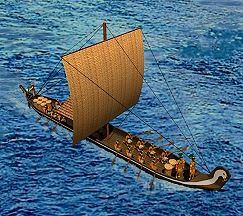 Rafts have been used in nearly every human society known to history and can be as simple as a carved plank of buoyant wood. 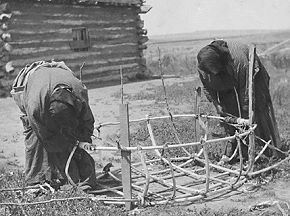 Most commonly, Native American rafts were made of sticks and branches tied together into a flat shape, and were used primarily for river crossings. One form of Native American raft that was more unique was this travel raft which was not only used to transport tribal members and their goods, but also had docking bays for the tribe's smaller, swifter canoes. 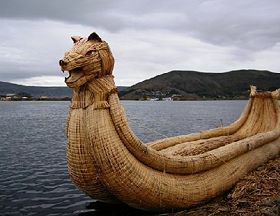 Reed boats are most important in South America, particularly in Bolivia and Peru, where the Aymara, Quechua, and other indigenous people built boats from bundled totora bulrushes. 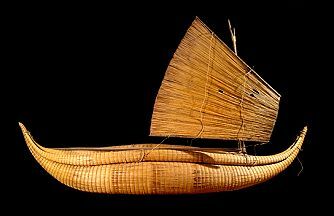 Some California Indian tribes built similar boats from tule and other reeds. Sails were rarely used in Native North American boats. In the US and Canada only a few tribes of southern Florida, such as the Calusa and the Ais, built sailboats. 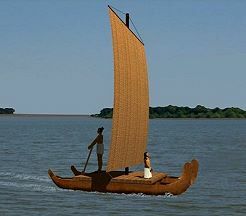 In Mexico and South America, however, native sailboats were more often used. Sails on American Indian boats were usually woven from reeds or from plant fibers, and had minimal rigging-- they were only used for sailing with the wind, not for tacking. 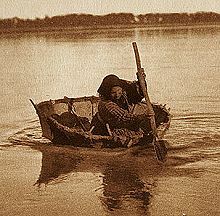 Are Native American boats like these still used today? Sometimes, but not very often. Canoeing is still popular among Native Americans in many tribes, but most of them use modern canoes, just as their non-Native neighbors do. Traditional Indian canoes are still made by craftsmen in some tribes, but they are most often used for display or for cultural festivals. 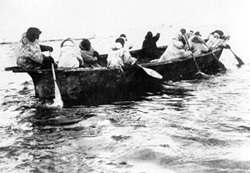 In Alaska, Northern Canada, and especially Greenland, some Inuit and Aleut hunters still take to the sea in skin kayaks. Aymara reed boats are mostly used for cultural events and tourism, but in a few communities smaller reed boats are also used for fishing. On the Amazon River and its tributaries, some South American Indian tribes continue to use traditional boat styles on a daily basis.